Inso's World: What an eventful day. As the title says, I have had an interesting day. 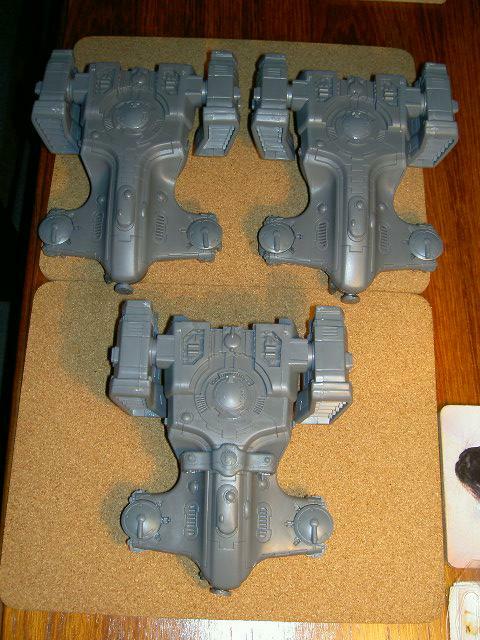 On Saturday, I completely failed to find any spray, Matt varnish so today I went over to a Hobby Craft store and managed to find some...so I can start varnishing my armoured vehicles when I fancy it. Switching back to Saturday again...while I was looking for Matt varnish I went into Games Workshop to replenish my stock of grey paint and while I was paying I made an impulse buy of some Liquid Green Stuff. I have been playing about with it today and it is very easy to work with and is perfect for filling the little gaps you get at the edges of plasticard constructions. I reckon it is a similar product to Squadron Green but it is a little more runny and easier to use because it is in a pot rather than a tube. 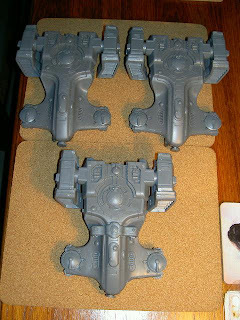 At the moment, I have some drying on some scratch built rocket pods and will be sanding them down when they are dry. When they are finished, I will let you know the results. So, after last nights MARATHON Green-Stuff work on the Airborne Assault Platoon's bases, I have painted them and have applied the sand. Again, I am waiting for things to dry before painting the bases. As most of you will notice, it is a Tau Devilfish with the drone wings clipped, the burst-cannon replaced with a Grymn mini-gun, rocket tubes added and an alternative cupola fitted. Unfortunately, the picture shows the Pilum Drop-ship before I got to work on it. Since this pic was taken, I have removed the rocket tubes to straighten them up, I have taken the top hatch off and improved the area and have cleaned up most of the joints/mould lines. I have been using the Liquid Green Stuff on the rocket tubes from three of these Pilums. The above pic shows the three Pilums before I decided to remove the drones. You will notice that the bottom-most one has a saddle over the front, just behind the cockpit. That designates it as the leader (it has some improved doo-dads!). So...I have been a busy chap today and even managed to get an 'almost' Mc Donalds breakfast. I arrived at 10:31am and ended up with the last sausage and egg McMuffin because breakfast had finished. See you from Toys 'R' Us!